Winter is here and the cooler weather makes me want to cook more. One of the things I like to cook is veggies. When I cook my veggies, I like to slow roast them in the oven. The roasting brings out a wonderful sweet taste to veggies. My veggie hating husband loves roasted veggies and will eat them right out of the oven. 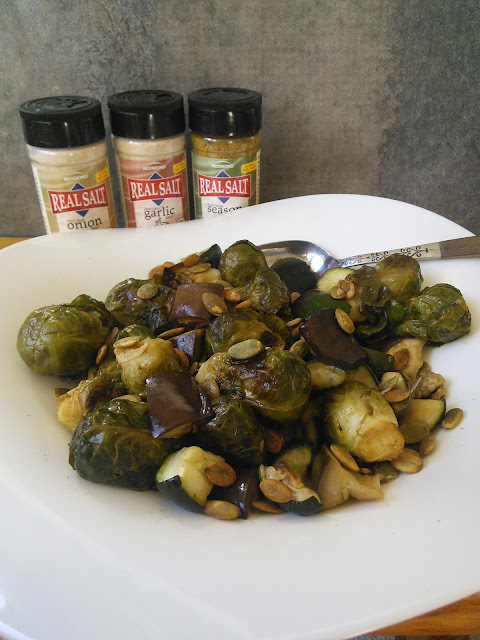 I like to oven roast many types of veggies but my favorite veggie to roast is brussles sprouts. I recently started oven roasting eggplant and love the way it tastes. The oven brings out a great taste to eggplant. I use to only eat eggplant covered in cheese and tomato sauce. I added the zucchini to the mix as I had some in the fridge that needed to be used up.The pumpkin seeds add a wonderful crunch to the roasted veggies. The one item that really brings out the flavor and sweetness of the roasted veggies is Real Salt. Now I know what you are thinking, salt is salt. I use to think that too until I tried Redmond Real Salt. This wonderful tasting salt comes from the sea and has nothing added to it, unlike other salts. Preheat the oven to 400°F. Peel off any yellowed or wilted leaves from the outside of Brussels sprouts and trim bottoms. Chop the eggplant and zucchini into bite size pieces. Combine all veggies in a large bowl with oil, Real salt and black pepper. Toss until coated. 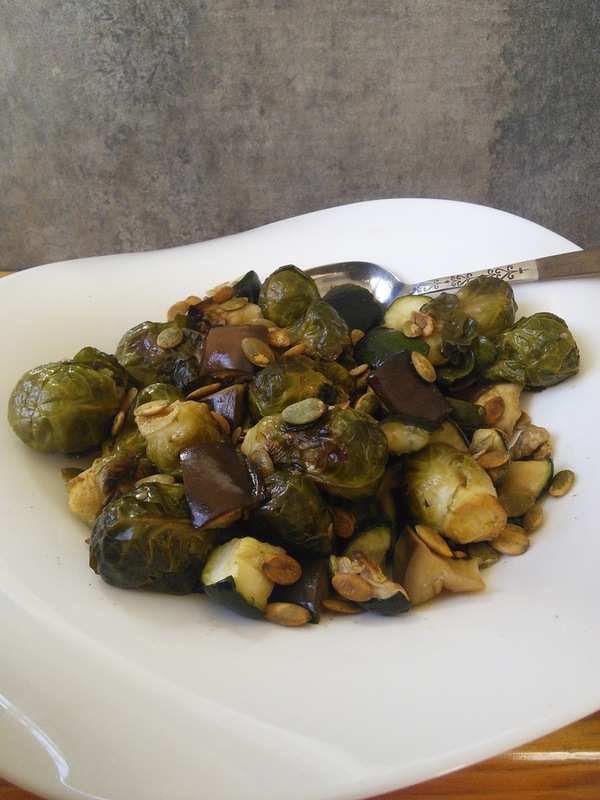 Place the veggies on a baking sheet and roast, stirring once or twice, until brussles sprouts are almost browned and just tender when pierced at the base with a paring knife, about 25- 35 minutes. Place the veggies in the serving dish and toss them with the pumpkin seeds. Have you tried roasted veggies? If so what is your favorite veggie to roast? Brussels sprouts are my favorite veggie! This sounds awesome. Absolutely bring the brussel sprouts and Zucchini but I wont eat egg plant At all. Allergy and other reasons. Yet recently I saw a recipe with egg plant and tried it and well I didn't react to it yayy! Hmm should I temp fate again...I don't know. we shall see thanks for sharing this oven roasted brussel sprouts eggplant! what apps do you use to store your favorite recipes? do you have a favorite app for your grocery list? I've roasted veggies before - but not my sprouts. What an interesting idea! 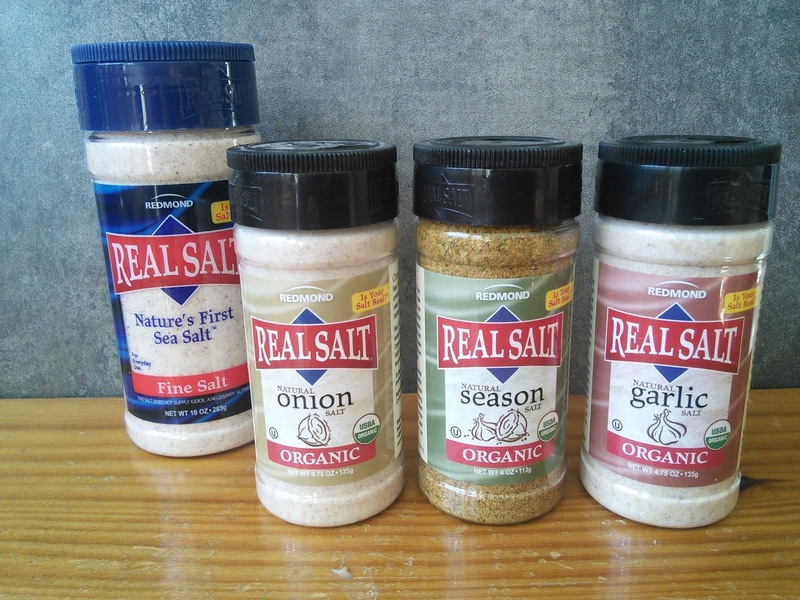 I have used real salt before, it is a good salt. Your roasted veggies look fantastic! Oh my does this look and sound absolutely amazing!! I would eat this for my entree lol!! That would definitely be something that my girls and I would enjoy! Thanks for sharing the recipe it sure looks yummy! This looks good. It has been a long time since I have had Brussels sprouts. I love zucchini and eggplant, and you are right the oven does bring out a certain taste in them. Not partial on brussel sprouts, plus they don't seem like sprouts to me, more like baby cabbage, LOL. Anyway, looks delish! I just made some roasted brussels sprouts yesterday! I love roasted veggies..
Looks absolutely delicious!! Brussel sprouts are hubby's favorite veggies. My hubby was love veggie so much. I need to try this for him. I haven't roasted veggies before. But those look so yummy. I'm going to love this one, it look so healthy and yummy. I love Brussels sprouts. I never thought to add eggplants. I'm going to make this tonight! This looks delicious! I never tried brussels sprouts until a few months ago, but I love them! I am not a huge fan of Brussel sprouts, but these look fabulous! I may have to try this recipe. I like the idea of the pumpkin seeds. You always come up with such delicious ideas. Those brussel sprouts are looking mighty, mighty fine to me! I love roasted vegetables. This looks so yummy! I wonder what it taste, I love healthy foods, I'm gonna try this one. The thought of brussel sprouts makes me frown. The only way I've ever eaten them is boiled, so maybe, just maybe, this recipe would change my mind about them. These are all wonderful vegetables to me and I do like them all. I also like to use Real Salt, it is wonderful. I am embarrassed to say I have not tried brussel sprouts yet. This looks like a recipe I would enjoy. Thank you for sharing. I love roasting veggies! My family can't get enough of roasted carrots and cauliflower, so I'll have to try this with brussel sprouts again soon. I added sliced fennel to the recipe since I had one around I needed to cook.I used pink Himalayan salt, freshly crushed. My husband who doesn't roasted eggplants had seconds, and we had to stop my 9 year old (who doesn't like any vegetables) from having all the Brussels sprouts!